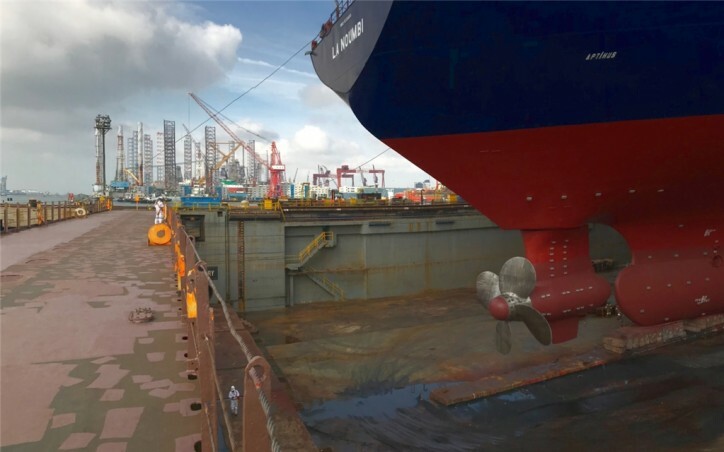 Keppel Offshore & Marine's wholly owned subsidiary, Keppel Shipyard, is on track to deliver a Floating Production Storage and offloading vessel (FPSO) for a Perenco Group project located off the Republic of Congo, Africa - on time and with a strong safety record. Scheduled for delivery in 3Q 2018, it will sail to the Yombo Masseko permit, held by National Petroleum Company of the Congo (SNPC) and operated by Perenco Congo. The FPSO was named La Noumbi at Keppel Shipyard Thursday (Jul 26) which was witnessed by Mr Jean-Marc Thysthere Tchicaya, Minister of Hydrocarbons, Republic of the Congo. Mr Chris Ong, CEO of Keppel Offshore & Marine said, "We are pleased to be on track to deliver a sixth project to Perenco to their satisfaction. Having delivered over 40% of the world's converted FPSOs to-date, we are able to leverage our rich experience as well as strong partnership with Perenco to deliver a high quality FPSO in a cost-efficient and safe manner. "This is also our fifth project for the Republic of the Congo and we are proud to have been able to support the development of the nation's significant oil reserves over the years. In fact, the FPSO Conkouati which La Noumbi will be replacing was first converted by Keppel Shipyard in 1991 and has served the Yombo field for more than 25 years." Keppel Shipyard's work scope on the conversion of the crude oil tanker into an FPSO included the installation and integration of topside process skids, fabrication of a new accommodation module as well as life extension works. Mr Benoit de la Fouchardiere, CEO of Perenco, said, "The FPSO La Noumbi project is a fundamental asset to maintain the production of the Yombo field 25 years after its first oil and enhance it through the green field development of Masseko, an undeveloped discovery located 10 km away. The FPSO has been designed during the oil crisis with a clear objective to demonstrate that we can continue to invest during the low oil price as long as we pay attention to all the details of a project and do not hesitate to be innovative at all steps. As this is not a given, by partnering Keppel we were confident that our project would be delivered safely, on time and on budget, with a clear execution of the new philosophy.”"